JTS is back again bringing both Japanese and motorsport enthusiasts together at Silverstone, the home of British Motorsport. Don’t worry if you cannot make it as a club - you can still show off your Jap car in the individual show car paddock. 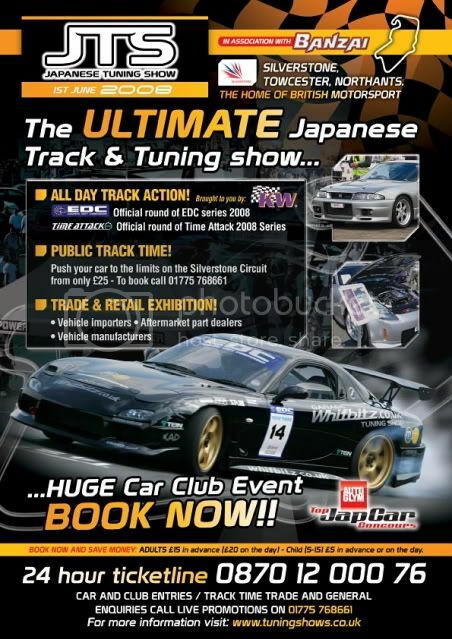 To book your car in download the club booking form on www.japanesetuningshow.co.uk and complete the individual car section. “The Autoglym Top Jap Car Concours” finals will be held in an elite arena in the heart of the show. To enter your car please email your name, contact telephone number and make and model of the car to info@auto-media.co.uk. You will then receive further instructions about the photo’s and spec details we will need. The closing date for entries is 12 May 2008 and all entries will be put forward to the judging panel, followed by all owners being contacted to advise if they have been successful.